But what if we could apply imaging techniques to transiting systems and directly observe transits? An exciting emerging technique that bridges the imaging and transit methods is called “transit interferometry”. Interferometry involves pointing multiple telescopes to an unresolved object, measuring differences in the observed signals, and using the differences to infer something about the true image. The math yields two magical quantities called a “visibility” (Figs. 1 and 2) and an angular “phase” (Fig. 2), both of which encode information about the image. Transiting planets in nearby systems could also involve scales of tens of microarcseconds or so. 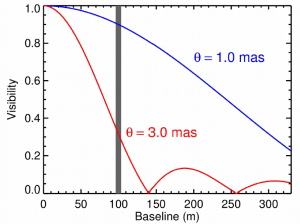 To avoid huge telescope baselines, we have to use shorter wavelengths (à la λ/B). Interferometric techniques at short wavelengths are starting to become useful for ruling out exoplanet false positives and for imaging planets in transition disks. As we continue to shrink the angular resolution, we edge closer to the possibility of imaging planets passing in front of their host stars. If astronomers actually pull it off, they’ll be able to independently measure the planet’s radius, observe the transit chord, and obtain information about the star’s surface to interpret other observations. The authors of today’s paper wrote a code called COMETS to calculate the interferometric observables of transiting planets, and transiting planets plus starspots, at visible wavelengths. The transiting planet is represented by a dark spot on the face of the host star’s limb-darkened disk, and the starspot is a simple disk that emits like a blackbody (Fig. 3). They consider what it would take to observe a planet spot by comparing the star to a star without a planet in front of it. They set detection limits for significant signals to have variations of 0.5%, 1%, or 2%. 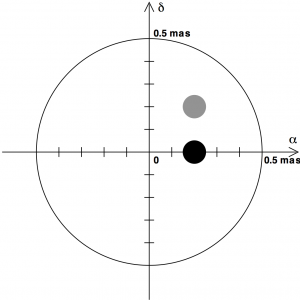 Based on their calculations of the “visibility”, they find that the needed baselines are at least several tens of meters, and preferably hundreds. It also turns out that the signature of a planet in the “phase” requires baselines of at least hundreds of meters. 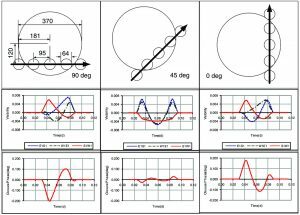 Minimum baselines to detect starspots are even more stringent because, as the spot temperature approaches that of the star, the spot blends in more with the stellar surface. Disentangling the combined effects of planets and starspots will also be difficult, but in principle it is possible. The authors looked at different instruments hooked up to the biggest visible/IR interferometers around: CHARA (capable of 331 m baselines), NPOI (up to 79 m at the time the paper was written, with current plans to go up to 437 m), and VLTI (up to 130 m). The baselines are already long enough to detect at least some transiting planets! The biggest challenge right now is the instrument sensitivity. The variations that need to be detected are currently too small by a factor of about 10. But improvements are on the way in the next generation of interferometers. The VLTI instrument GRAVITY saw first light in 2015, followed just a few weeks ago by MATISSE. Several space-based interferometers for exoplanet characterization have also been proposed. As instruments come to maturity in parallel with advances in adaptive optics, control systems, and detector sensitivity, it’s just a matter of time before interferometry is part and parcel of exoplanet characterization.